Jill Purce is a British voice teacher, Family Constellations therapist, and author. In the 1970s Purce developed a new way of working with the voice, introducing the teaching of group overtone chanting, producing a single note whilst amplifying the vocal harmonics. 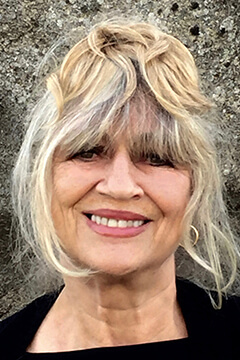 Jill pioneered the international sound healing movement through her rediscovery of ancient vocal techniques, the teaching of overtone chanting, the power of group chant, and the spiritual potential of the voice as a magical instrument for healing and meditation. She pioneered the practice of healing family and ancestral traumas with her Healing Family and Ancestor and Resonant Family Constellations, and the activation of the mandala as a living practice with her extended Mandala Ceremonies. After her postgraduate Fellowship in the Biophysics Department at Kings College London, working with Maurice Wilkins (Nobel prize for DNA), with whom she dialogued on the relationship between art, science and spirituality, she lived and worked in Kürton with German composer Karlheinz Stockhausen, exploring the spiritual dimension of music. She learned overtone chanting in the Himalayas with the chant master of the Gyutö Tibetan Monastery. In 1974 The BBC made an hour-long documentary film about Jill and her work More Ways Than One: The Mystic Spiral. She produced over 30 books as General Editor of the Thames and Hudson Art and Imagination series. This series pioneered a thematic approach to the spiritual and psychological meanings of the art of different cultures. Jill has been following the philosophy and practice of Dzogchen since 1978, when she started working with the Tibetan Lama, Namkhai Norbu Rinpoche. She lectures and conducts workshops internationally, especially The Healing Voice, exploring diverse forms of spiritual chant and guiding non-singers and singers in their pursuit of the lost voice. She has taught the English National Opera and The English Shakespeare Company, as well as teaching in hospitals, schools, monastic communities, and businesses. In the last 20 years she pioneered her workshops, Healing Family and Ancestors, a unique combination of Family constellations, chant and ceremony. Some of her published articles include: Patterns of Growth in Nature and Consciousness; Time and the Music of Form; Creative Tension; Harmonics of Mind and Body; Sound in Mind and Body; Healing Resonance; Re-enchanting the World; The Healing Voice; Being in Tune. "I was there. I was producing two notes, the greater and the lesser, the lower and the higher at the same time. I can only compare the exhilaration, and slight shock, with the notion of some experience that I have never had: say, discovering a new limb or sense, finding a bowling green in the bathroom, or being given instant familiarity with a foreign language... it is hard not to feel that you have tapped yourself into an awesome and timeless sense of wellbeing." "At the workshop the real magic took place when Jill Purce demonstrated the overtone chanting which was to become the focus of the weekend. This makes audible the natural spectrum of the voice so that flute-like harmonics are heard rising above the single note. It was a celestial sound, ethereal and haunting and far more impressive than any trick of conjuring or ventriloquism I have ever seen. More extraordinary was when we were each shown how we, too could make such sounds. By the end of the weekend I studied the faces of the group and was convinced by her methods; everyone looked relaxed and claimed to feel both euphoric and calm." "Jill Purce's workshop was an extraordinary experience. I felt I got more in contact with my own sense of identity, more balanced, and it was a lot of fun." "Jill Purce is blessed with radiant, good-humoured self-confidence, as well as a resilient, primeval quality of beauty that reminds one of Piero della Francesca's madonnas. She can teach you to make a sound which is like nothing else on earth. It is your "own" note, and the idea is that prolonged chanting of this unique sound will decompose your harassed everyday self (in the same way that one particular note can shatter glass) and carry you 'across the threshold from the normal to the sacred world.'" "When Jill Purce tells you her aims are not modest she is speaking the truth. Her aim she will tell you, is no less than the transformation of humanity. Can it be done? She has already started.... The instrument Ms Purce is using for this purpose is the human voice, yours and mine. She would set us all humming and chanting ... you may think this is fanciful but I have to tell you that when Jill Purce tells you to hum you hum. She is a most persuasive woman." "Today, Jill Purce is Britain's best known music healer." "Jill Purce has set out to enable those who study with her to recapture the lost rapture of resonance so familiar to the ancients. She cultivates in her classes an echo of now-distant rituals, calling up ageless rhythms and sounds ...Once I loosened my jaw and got comfortable in my seat, I found that simply opening my mouth and letting my breath leave my body produced the most wondrous, comforting sound. And after playing a bit with the register and deepening my breath, the overtones started to come unbidden. Once that happened, I just rode the waves of harmonics pealing like cathedral bells in my body. Soon it seemed that the overtones were emanating from my very bones - from the region bounded by my shoulders, collarbone, and cranium. And I had the thought, This is what the crystal glass must feel like when I rub my finger on it. The only problem I had with the exercise was that it ended too soon. What was surprising to me was that, although I am normally about as given to meditative exercise as a cow is to flying, I found this particular ritual effortless, pleasurable, and uplifting. 'If this is meditation, I guess I can do it,' I thought, just about the time Purce was saying, 'chanting in general is the easiest way to meditate'." 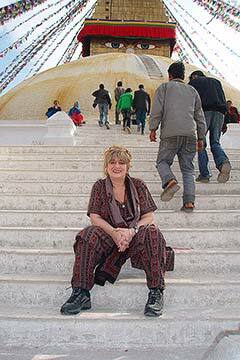 "Jill Purce is an unconventional guru, an intellectual with the look of a golden earth mother. The sound she demonstrated is uncanny - piercingly beautiful." "Jill Purce's brand of 'musical medicine' has proved to be a life changer, helping the pregnant to give birth easily and enabling other people to 'unblock', relax and grow." "I find myself in a room with thirty other people. We are chanting chords. Chords! One person calls it the music of the angels. Certainly it is unearthly. It is all part of a sound workshop run by Jill Purce, one of the world's few teachers of the singing technique known as Mongolian overtone chanting. Jill's workshops are a fascinating experience." "Jill Purce teaches what can only be described as spiritual awareness through sound."